As many regular visitors to Rickwood B&B will know, Portpatrick Harbour was purchased in 2015 by The Portpatrick Harbour Community Benefit Society. This remarkable achievement was made possible by a community share offer which was a resounding success. The shares were fully subscribed within three weeks providing the Society with much needed funds and 550 members. It has been said of Portpatrick Harbour that it is as important as the village green is in other communities and we agree. Almost three years on and much progress has been made by its new owners – our community! In their Summer 2018 Newsletter, we are reminded of recent activities, not least of which was the acquisition for Dumfries & Galloway Council of the toilet block, thereby saving it from closing. The land known as the Ward Shore above the toilet block has also been purchased – both for a total of £2! A facelift is planned for the outside of the toilet block and internal work will also be carried out to increase the facilities available. Late last year, a decorative festoon lighting system was installed round some of the inner harbour which are illuminated at dusk each evening. The LED lamps are very energy efficient and we are told that all 150 cost only about 4 pence per hour in total when lit. The installation work was carried out by local volunteers. Last, but not least, as the surface of the harbour was very damaged after years of neglect by the former owner, the entrance to the harbour has been resurfaced with tarmac while the area around the lifeboat shop has also been resurfaced with concrete and some landscaping work also carried out. Two sandstone platforms were uncovered during the work and they have been preserved. Looking ahead, more funding is being sought to renovate the old harbour buildings. 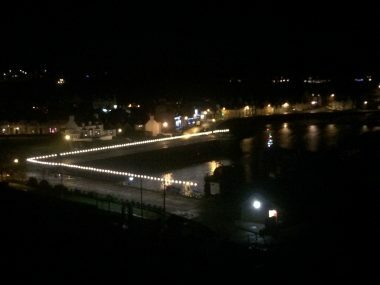 It has been great to see more boats visiting Portpatrick Harbour and staying overnight as a result of the improved facilities and Fred & Maggie at Rickwood B&B offer Portpatrick Harbour Trust and all involved congratulations and thanks.